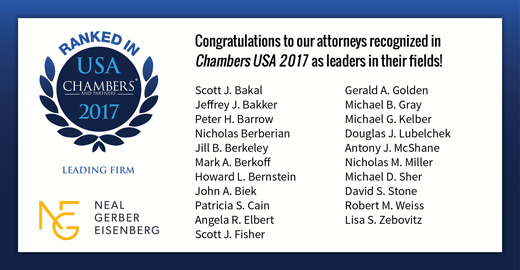 Chambers USA today announced their annual rankings for 2017, which include 11 Neal, Gerber & Eisenberg LLP practice groups and 21 attorneys. Neal Gerber Eisenberg is also proud to announce that Scott J. Bakal, co-chair of the Taxation practice, and Michael G. Kelber, co-chair of the Intellectual Property practice, have joined the firm’s list of recognized attorneys. Chambers & Partners, one of the world’s leading legal directories, conducts independent research that relies on feedback from industry leaders and clients to identify the top attorneys and law firms from around the world. "I was very impressed by their skill. They are clear, effective and efficient communicators who not only got the job done but went above and beyond." "The service they provide is exactly what I look for in our outside counsel. They do a phenomenal job!" "They truly understand client service. They are responsive and set timeframes and expectations throughout the process and then meet them." "They're outstanding and very responsive. They're very strong at what they do. They help us make tough decisions and they're also excellent writers." "They are proficient at navigating complex transactions and are extremely responsive. They give practical advice and are focused on results." "They are outstanding in every respect."